(Mother Earth News) This DIY, wood-fired, outdoor masonry stove can be used four ways: for baking, grilling, cooking, and smoking. Whatever your cooking needs, our outdoor stove/oven/grill/smoker can do it, thanks to interchangeable grill grates and griddle surfaces. If you want to grill steaks or fish, use the grill grate. If you want to bake bread, slide on the steel griddle, stack some bricks on top to retain heat and add the door to hold in the heat. If you want to use the stove top, just slide the metal plate (or griddle) over the top of the firebox. You can build the outdoor oven in stages, a few hours at a time. (You’ll need a few days between some steps.) Check local building codes before you start building. The oven is made from materials you can buy at local hardware or building stores. You may be able to find some of the materials at a salvage yard, too. (See the materials list and the building diagram). Detailed instructions for building the outdoor brick oven are below. Even if you only use it to bake bread, you can save enough money in one year to more than pay for the $300 cost. Ideally, the stove is built to a comfortable height with concrete countertop space on each side, plus a roof to protect against the elements. We covered the concrete blocks with tile, primarily for aesthetic reasons, but you could apply stucco over the blocks, or just paint them. Having an outdoor sink and storage space nearby is also convenient. Our outdoor oven requires a fire in the firebox for about 45 minutes to one hour to reach a baking temperature of 450 to 500 degrees Fahrenheit. Or, if you want to grill, you can start in less than half an hour. For comparison, it can take about three hours to get a clay earthen oven up to proper baking temperature. That’s a lot of time and firewood expended, which really adds up if you’re using the oven frequently. The firebrick used in our stove reaches cooking temperature more quickly than clay because its higher density makes it more efficient at conducting heat. Another key design element is the firebox size — not too small, not too large, but just right. Properly sized fireboxes heat up quickly, have improved combustion, produce less smoke and stay hotter longer. We measured cookie sheets, bread pans, medium and large roasting pans, canners and baking dishes to arrive at our optimal firebox size of 13 inches wide by 28 inches deep by 13 1/2 inches high. If you like to cook, you’ll love this stove. Our favorite cooking technique involves cooking foods in rapid succession at dinnertime. We like to start out with pizza when the oven is about 500 degrees. The pizza bakes in about three minutes. After that, the oven has cooled to 350 to 400 degrees — perfect for baking bread. (The temperature of the air in the oven drops momentarily when you open the door, but the brick is still hot and maintains temperature.) Sometimes we throw in some potatoes at this stage if we want baked potatoes. When the bread is done after about an hour, we bake various combinations of veggies (and sometimes dessert). You can bake a lot of food from one firing. And if you want added heat — to bake extra loaves of bread, for example — just keep a small pile of coals burning in the back of the stove. Our plan includes a grill grate at midoven height for grilling food closer to the coals. This grill grate adds extra space for baking, almost doubling the capacity of the oven. It also provides space for a tray of water for bread recipes that require steam. The outdoor oven is a super barbecue! About 95 percent of the smoke goes up the chimney after the fire is going strong, making for a pleasant grilling experience. There are two grilling surfaces (one on top and one at midheight). The heat remains steady with minimal fuss. And if you like more control over the grilling temperature, adjust the damper and add the door. 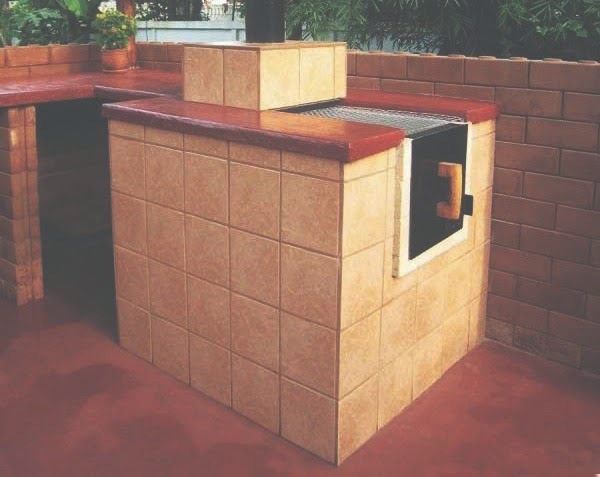 The outdoor oven provides the main requirements for a good smoker: It retains heat well, plus the damper and the vent in the insulated door allow you to control airflow. Use the grill grate (shelf at midheight) for holding food. Keep a small fire going and cook until tender. Unlike many smokers, large chunks of meat (even wild game) can fit easily in this stove. Using the stove for canning keeps extra heat out of your house during some of the hottest times of year when lots of vegetables are ripening. Just close the oven door and put the steel plate on the oven to use the cooktop. You can also use the stove top for sautéing, stir-frying or anything else you’d use a conventional stove top for. Setting a canner on the grill instead of the stove top is even more efficient because the fire heats the canner directly instead of transferring heat through the steel plate. In addition to all the other cooking options, you can cook in a Dutch oven placed inside the firebox. Dutch-oven cooking is ideal for stews, chili, roasts, certain types of breads and rolls, beans and some desserts. It’s more efficient to use the Dutch oven inside the outdoor oven than outside on a campfire because it requires fewer coals. Learn how to build it here. I hope that you and Kerry are both doing well and happy! is a connection. But I a, not a doctor and she needs a good one. appreciate it. Name and number/ address.